This account is to pay tribute to the courage and fortitude shown by our mother during World War 2 who never gave up hope that her husband would return. She was born in Thornton Heath in Surrey and was adopted so we knew little about her birth family. 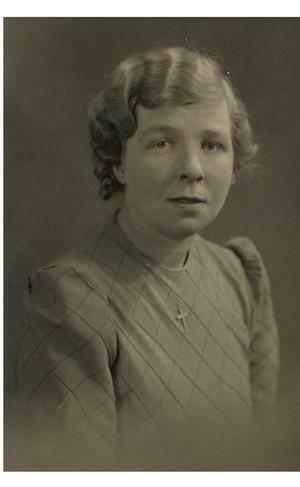 She worked as a shop assistant in Croydon and they married in 1937. They moved to Croxley Green near Watford, Hertfordshire as Dad had taken up a job there as store salesman in Burton Taylors. Mum joined the Womens' Land Army in 1942 because it gave her a sense of purpose in trying to help the war effort, and it provided a means of trying to distract her from her anxieties about her husband. She told us children ( Peter born 1947, Christine 1949 and Rosemary 1951) about some of the jobs she did including helping in the harvest. This involved collecting the stalks of corn to make into “stukes” which would be used for winter fodder for farm animals. Large rats would run about the field which frightened her. She also helped to dig root crops such as potatoes or swedes, and picked cherries in orchards in Croxley Green. Mum found the work very hard but she enjoyed the companionship with the other women. She was paid one shilling (now 5p) per hour, and had to give up the work on medical advice because it exacerbated her rheumatism. Dad was taken prisoner at the fall of Singapore in the Far East on Mum’s 29th birthday.He had sent her a birthday greetings telegram from Singapore, so she knew he was there and alive on this date, but she then had to wait another seventeen months before she heard any more about him. During the remainder of the war our parents were able to keep in touch by letters, postcards and telegrams, and some of Mum’s have survived. Nineteen of them were brought back by our father. They relied on the British Red Cross and the Order of St John, who set up a war department in London to try to facilitate correspondence getting to overseas POWs, although not all reached their destination. Letters were limited in length and frequency and were stamped by the Japanese guards indicating that they had been censored. Underneath the dates of the letters Dad has written the dates he received them - generally one year to eighteen months later. They are full of loving thoughts and concern about his welfare, and telling him not to worry about her. On 11 July 1943 she wrote “ I am feeling one of the happiest people in the world for I received my first postcard from you telling me the wonderful news that you are safe and well. How I thank God dearest”. Dad did not receive this letter until 3 February 1945. The Red Cross also organised monthly meetings in Rickmansworth for wives of POWs, to try to keep them informed of any news about their loved ones. Mum found these some help and used to attend with her neighbour Mrs Pope, whose husband Jim had joined up at the same time as Dad. They were together in Thailand. On 27 September 1944 she attended a service in St Paul’s Cathedral where prayers were said for those who were in captivity in the Far East. When the war against Japan ended on 15 August 1945 Mum was able to send letters more frequently and on 22 August 1945 she wrote “ By the time you receive this you will be in safe hands and receiving the very best of food and attention that you all so badly need”. It wasn’t until10 September 1945 that she received official notification from the War Office that he had been freed. She was now able to write much more frequent letters telling of her love and excitement at the thought of him returning after four years away and she becomes increasingly impatient. However, it is not all good news at this time as in one of the letters from Dad he tells her of Mr Pope’s recent death in the camp. Mum took the very difficult decision to tell her friend of her husband’s death, rather than wait for her to hear officially through the War Office. Our parents were finally re united at the end of October 1945 after a four year separation. How did they survive when many did not ? Firstly they had a deep and enduring love for each other. Secondly they both had a strong Christian faith which gave them hope for the future. Dad was able to attend regular services even in the POW camp. Thirdly, they had good friends and supportive families and every one else was experiencing similar difficulties and hardships during the war. Finally, the fact they were able to keep in touch by letters was also very important. Like Dad, Mum also found it difficult to adjust after the war. She also felt angry and bitter towards the Japanese because of the way they had treated him and was never able to forgive them. She also felt bitter that they were never able to own their own their own home, but had to keep paying rent with nothing to show at the end, and this contributed to their financial worries. Dad was told that because of the lack of adequate food or medical care it was unlikely former POWs would be able to have children, but in fact this was not a problem and they were able to have the children they wanted. Mum stayed at home to look after us but later she worked as a much loved “dinner lady” at Little Green School, Croxley Green for 15 years. She worked there until she retired and was very happy. She was also very happy when she became a grandparent, and was the devoted “Nanny” to her five grandchildren — Jackie, Wendy, Stuart, Andrew and James. She loved having them to stay. We all felt very sad that this period of her life was so happy, yet was cut short by a stroke just before her 69th birthday. This account is to honour and pay tribute to our father who, with great courage and sacrifice, survived three and a half years in a Japanese POW camp in Thailand during the 2nd world war. He returned home to his devoted wife Winifred Beatrice Wells (nee Chapman), whom he called Lassie, and they subsequently had 3 children, Peter in 1947, Christine in 1949 and Rosemary in 1951. He was born in Addiscombe, Croydon, Surrey and they married in 1937 at Croydon parish church. They moved to Watford, Herts as he had just taken up a new job at Burton Taylors as a store salesman. He had just become a volunteer in the National Fire Service when he was called up in 1940. As our Dad’s father (Edward John Henry) had served in the army during the first world war ( 14th Battalion, Royal Fusiliers), and grandfather (Edward James), in the 3rd Norfolk Regiment for 30 years, he too joined the army. As his local regiment, the Beds and Herts had no vacancies, he enlisted in the Suffolk Regiment on 24 June 1940 because this is where his family had originated. His three brothers also served in the second world war, Walter in the Merchant Navy, and Jack and Bert in the Royal Air Force. The former was killed in a mission over Germany. He joined up with one of his neighbours, Mr Jim Pope, who did not return alive. Before they went overseas, Dad trained as a stretcher bearer, which gave him protection under the Geneva Convention 1929 to give medical assistance to battle casualties. In June 1941 he undertook further training in fire duties. At some point he was stationed in Hawick in Scotland which may not have been the most suitable environment for their subsequent encounter with jungle conditions in the Far East. After two weeks home leave, spent with our Mum in October 1941, he was away for the next 4 years, during which time they attempted to correspond by letter. Only one of his letters survived dated 31 October 1941, in which he describes sleeping in hammocks on the boat as they travelled to the Far East. It was a hospital ship and he talks about learning the treatments and routines of the medical officer in charge. He was also able to attend regular church services on board. Dad told us that after arriving near Singapore he was involved in fighting in the jungle before his capture. He came under shell fire from the Japanese troops and they had to dig holes to take cover, One of his colleagues who dug a larger hole was killed while he survived. Dad was taken prisoner by the Japanese on 15 February 1942 after the fall of Singapore with many thousands of other British and Allied troops. This date was our Mum’s birthday and he had just sent her a greetings telegram from Singapore when he was taken prisoner. He was initially held in Changi prison in Singapore until 6 November 1942 when he was moved to Ban Pong No 1 POW camp in Thailand. Dad worked in the base hospital as a medical auxiliary, caring for fellow POWs and did not have any involvement in the building of the Thailand — Burma railway. He talked to us as children about some of his experiences as a POW of the Japanese. He observed some very barbaric acts by some of the guards, but he did not find them all equally bad. The guards were routinely referred to as “Nips” because of their small stature compared to the British soldiers without them being aware this term was derogatory. He learnt some words of Japanese and how to count, and they taught some of their guards English words in return. However, they pretended when playing cards to count Jack, Queen, King, Ace instead of eleven, twelve, thirteen, fourteen so that the guards learnt the wrong words. This enabled them to find humour in their situation as well as to prevent their spirit being broken. Another story we remember is about his name HG Wells. He was uncertain whether to pretend he was the famous author who was Herbert George (not Geoffrey). He thought this might lead to better treatment, or possibly worse, so he decided against this. On 19 February 1944 he was transferred to Nong Pladuk POW hospital for treatment for tropical leg ulcers, and then to Nakawn Patong POW hospital on 15 May 1944 for the same problem. After a long sea journey on the SS Orduna, Dad arrived at Liverpool docks on 13 October 1945. 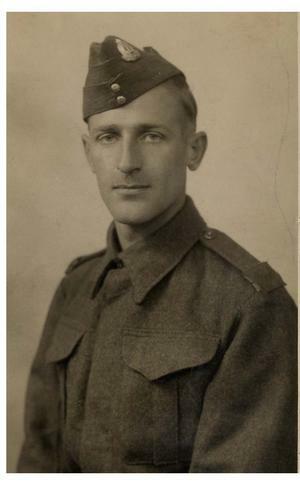 He first went to a reception camp in England and on 19 October 1945 he was discharged “fit for leave”. He had a medical examination where he reported having contracted malaria, tropical leg ulcers, beri-beri and dengue. Mum had contacted the Red Cross and they arranged for him to be brought home by car from Euston Station. In a copy of the Watford Observer reporting his safe return home, our mother said “ I’m so excited, I don’t know whether I’m on my head or my heals”. Our father was discharged from service on 14 January 1946 saying his military conduct was “exemplary. He was a clean and cheerful man, hard working and honest”. POWs returning from the Far East were given double food rations for 6 weeks and could buy 6 weeks supply of cigarettes, chocolate and sweets at reduced prices. He was awarded 3 medals for his war service : the 1939-45 star, the 1939-45 War Medal and the Pacific Star with Burma Clasp. During the war our parents tried to keep in touch by letters, post cards and telegrams. The British Red Cross with the Order of St John set up a war department in London to try to facilitate correspondence getting through. Mum only kept one of Dad’s letters dated 31 October 1941 — letter number one. She told us later that she destroyed the others she received because they were stamped with marks made by the Japanese censor and she wanted no reminder of his captivity and ill treatment. Perhaps our father did want to keep his wife’s letters — a total of 19 survived, which are full of love and concern — because having them was a major factor in his survival in the camp. He has recorded in pencil the dates on which he actually received each letter or card. Two letters Mum wrote in June and July 1942 were not received by him for over one year. On the back of one of these letters he has used the blank paper to record the full name, rank and whereabouts in alphabetic order of his fellow POWs as well as the total number of losses by June 1944 of 332. Paper was in very short supply but by keeping this sort of information hidden from his prison guards he would have risked death if it were found. Following a period of paid leave he was able to return to his job as store salesman at Burton Taylors in Watford on 3 April 1946. Dad found it very difficult to adjust to things on his return, though he tried not to talk about his experiences, especially to Mum. He was able to work and remained at Burtons Watford for 40 years. However his health was affected and he suffered recurrent bouts of malaria and a collapsed lung. Our parents struggled financially, especially after their children were born, although we were very much wanted. They had planned to buy their house in Croxley Green but the war began before they were able to. After the war this was no longer an option, and they continued to pay rent with nothing to show for it. Our parents felt angry and bitter about this situation, especially after their experiences during the war that they were never able to own their home or pass it on to their children as many of their neighbours had done. Initially Dad did keep in touch with some of his ex comrades in the Suffolk Regiment, but gradually he lost touch with them. He became increasingly isolated socially, apart from his job, and withdrawn emotionally. He loved his garden and grew fruit and vegetables. He built a greenhouse and keeping his flower beds was his pride and joy. In spite of the financial problems we were able to enjoy family holidays at the seaside, though only for one week initially. We went to Broadstairs, Kent one year, but the Isle of Wight soon became the firm favourite, first at Sandown and later at Ventnor. For several years we hired a house called “Woodstock” and by now we were able to go for 2 weeks. When war was declared in 1939 I was 10 years old. My parents were glued to the wireless and I remember the posh voice of the announcer struggling to be heard through the crackling noises it made. With great speed arrangements were made for children to be evacuated. We lined up outside of the school, St Andrew’s, Holborn, London, to be sent away from all we knew and loved. We boarded our transport and crowded at the windows to wave goodbye. My mum was crying. We arrived at our secret destination, which turned out to be Croxley Green, near Watford, Hertfordshire, all of 20 miles from London! We used to stand outside in the evenings and see the sky glowing red from the fires in London. The children and 2 teachers, Miss Smith and Mr Marriot walked up and down the roads, the teachers knocking at the doors and asking the tenants if they could take in any evacuees. Eventually, there was only me and another girl, Irene Sedgewick, left. My teachers laughingly said I would have to be billeted with them and I could make them a cup of tea in the mornings. I was terrified! At last we found a home with Mr and Mrs Morley. Some of the older children were absorbed into local schools but most of us were taught in a church hall. We sat a trestle tables and a poor teacher was allocated 2 or 3 tables to teach. When Irene Sedgewick became 14 she immediately went back home. I hated being on my own and arranged with another girl, Beryl Powell, to run away. However, she did not turn up at the station so I decided to go alone. I arrived in London and felt hopelessly lost. Fortunately, I had an Uncle, William Malkin, who I knew had a telephone so called him. My cousin, John, who was on leave from the army came and collected me and took me to their home in Barnsbury Street, Islington. Uncle Bill and his family were moving to Biggin Hill, Kent and had a daughter, Pat, my age and so offered to take me with them. 1. If a coalman can carry a 1 cwt sack of coal for 10 yards how far could he carry 20 cwt? 2. If you drop a stone down a well and it takes 10 seconds to reach the water how long would it take 2 stones? I won the scholarship and went to this wonderful school from where you could expect to get a job in an Embassy, the Foreign Office and the Houses of Parliament etc. But unfortunately, my parents decided to move back to London. When the school authorities discovered I was travelling to and from London each day they said I could not be allowed to stay at the school. My dreams of a glittering career were dashed. This story was added to the BBC history website by a staff member at Sprowston Library, Norwich, Norfolk with the permission of the writer, Irene Abney nee Chambers. In 1939 I was six years old and knew very little about how the war would affect me. I had two brothers younger than myself and my mother was seven months pregnant when the declaration of the war was announced. Far more important to us was the preparation for the arrival of the new baby. At the beginning of the war there was very little impact on my life, which went on as normal. We had to take gas masks to school but otherwise life continued as usual. Gradually, however, one after another, my small friends would come and say that their Dad had been 'called up' and had to go away. My Father did not get called up and it was only much alter that I found out this was because he was a printer for HMSO where all the official government papers and documents were printed, and the skilled men who worked there had to stay and continue their essential job. We lived in Harrow, Middlesex. When the Blitz began life began to change. We were given a shelter, which was like a huge table, which almost filled the dining room in our small house. It was made of metal and underneath we arranged some blankets and mattresses and slept there every night. We lived in Harrow at the time and I had an Aunt who lived in Croxley Green, Hertfordshire. It was considered dangerous in Harrow but Croxley Green was out in the country in those days and hardly ever had any bombs so we went to stay with my Aunt. I suppose this was the first evacuation for us but because we were all together we didn't suffer the hardship of some of the evacuees. When the Blitz eased up we went home again and life continued much as before, except that rations were much less and food was very short. My mother was a great tea drinker, with three spoons of sugar in each cup, so rationing was very hard for her, even though she used all the coupons for the whole family! So life went on despite all the difficulties. In 1941 another baby arrived in our household and in 1943 another little boy, which completed our family. Shortly after this a new weapon appeared in the sky, the 'Doodle Bug', and it was terrifying. First there was the air raid siren (and even to this day the sound of this on radio or television will send shudders up my spine), then would come the sound of German planes overhead. Then the sound as they dropped the 'Doodle Bugs', a strange whistling noise. When this noise stopped you knew the bomb was very near and would begin to fall. At this moment we all took cover. I can remember one occasion when we were in bed, the siren had gone off and before we could get down to the shelter, my mother had pushed us all into the wardrobe! We waited, then heard a terrific noise, the bomb had fallen just four doors away from us, the house and occupants were all destroyed. By now I was ten years old and had a much greater understanding of the war. it was after this incident that my mother decided it was time to take us all to a safer place. Through the evacuation scheme we were sent to Wales. We went by train from London and for us children it was a great adventure, but I never knew how my mother felt about it. She was born and raised in Central London and only moved to Harrow (which she considered to be the countryside) when she married my father. We arrived in Wales (later we discovered we were in Anglesey) and the WVS took us to a school hall that had been set up with beds and a canteen while we waited for our billets. There must have been about 100 people there, both families and lots of children by themselves or with brothers and sisters. Because we were a fairly large family and my mother refused to separate us, it took a while to find accommodation. I suppose we were there for about ten days. The WVS were very kind and we lived in the school hall while we waited. We played games like ludo, dominoes and cards. There was nowhere to run around and we didn't go to school. Then they found some accommodation for us in a seaside village called Benllech. We were to live in an empty 20 bedroom hotel. There were no inside toilets and all the rooms were empty, except for a family of evacuees from Liverpool. The kitchen was huge and the cooking was one on a big coal fired range. The garden was a wilderness but, joy of joys, led down to the sea with a wonderful empty white sandy beach. When we arrived the WVS left us with a few essentials, but then came the problems. My mother went to the shop to buy some food to discover that as we weren't registered with them they could not accept our ration books and we could not buy any food at all. The WVS tried to help, without success, and this went on for six weeks. We survived on what the WVS bought us — dried milk from America, national orange juice and a few vegetables — and the bread, which we were allowed to buy, and sometimes a local resident would send over a cake or pot of soup. The Liverpool evacuees also shared some of their rations with us. On one memorable occasion, a man arrived at the door carrying what appeared to be two rabbits (we later found out they were hares), complete with head, skin and dripping with blood. My poor mother had no idea what to do with them but we were so hungry that my brother and I, with instructions from the lady from Liverpool, skinned, beheaded, cleaned and cooked them into a stew. What a feast! The day our ration cards arrived I will never forget. We all went to the shot and my mother laid out the ration cards for all seven of us and said "I'll take it all!" the poor man did not know what had hit him as he tried to calculate seven ration books for six weeks' tea, sugar, butter, flour, eggs, sweets and much more. Finally he came to the jam and asked with astonishment "Do you want it ALL?" to which my mother replied yes. The jam was on the top shelf and he went up and down seven times to get 14lb of jam! When we got home we ate and ate until we could not put a single thing more in our moths. Never had anything tasted so good! When we arrived in Benllech enquiries were made about our schooling. We came from Middlesex but because we were living in Wales the Welsh authority had an obligation to educate us but the only school available was Welsh speaking, so they would not take us. Never mind, there was a small school run by the Liverpool authority for its evacuees but we could not go there because the Middlesex authority said the Welsh authority had to pay them and the Welsh authority said it was the responsibility of Middlesex to pay! We were in Wales for about a year and never went to school during the whole of our stay. 1944 was a brilliant summer and the six of us had a wonderful time roaming the woods and fields, exploring the beach, swimming and playing to our hearts content. If it rained we had 20 bedrooms to play hide and seek in and we made up plays, sang songs and listened to the radio. Strangely, my education did not suffer unduly but this was partly due to the WVS who set up a travelling library and brought us books each week. I was living, with my parents and brother, at Croxley Green in Hertfordshire. In May 1940, as soon as I reached the age of seventeen, I volunteered to join the women’s land army. However this was before it was properly organised by Lady Denman. I was sent, with my school friend Joan to Burloes Farm, just outside Royston also in Hertforshire. We were to live with the cowman and his wife in their small house. I must say that the food was atrocious — very little of it. I remember quite often, only a very small meat pie (costing two old pence!) on the plate, with no vegetables, and only skimmed milk all the time we were there. All the young men farm worker had already been ‘called up’ with the exception of Billy, who trained us for one week before he too had to go. My job was to look after the pigs and the chickens which I loved. But twice a week I had to first of all catch two chickens out of about 500 running free in a field and then wring their necks! I then had to pluck them and finally prepare them for the table. The first time my friend and I made a dreadful mess of trying to wring this poor animal’s neck. In the end, after appealing to the heavily pregnant farm manager’s wife, we advised to put its head on the block and chop it off! Poor thing - I can see it now with blood everywhere. Looking after the pigs was a little better, mixing their food and mucking out. The baby piglets were adorable but when they had to be killed (I can’t remember who did this, possibly the man who bought them and collected then to take to market) it was heartbreaking. We were also expected to help generally on the farm. I remember the back breaking task of planting acres of potatoes by hand and another time when the sheep escaped out of their field and we had to help round them up. For all that it was a great, healthy experience. I grew up in Battersea, London and in 1942, applied to join the Army. Technically, at 17, I was too young, but as often happened in those days, I fibbed a year onto my age! My good friend at the time, Freda Thompson, the daughter of publicans at Croxley Green, joined up with me (although she actually was 18). My mum was angry at my decision to go and do my bit for the war effort, and threatened to inform the Recruitment Office of my real age. She never carried out her threat, though; I suspect that secretly she was proud of me, although of course very worried for my safety at the same time. It must have been very difficult for her, because my eldest brother and my sister also joined the army, and my younger brother joined the navy. A whole family had marched off to war. Our first Barracks was at Leicester for initial training where Freda and I were allocated our kit and underwent basic square-bashing. From there we were posted to Devises to be trained to man the AK-AK battery there. I was trained up to be what was called a Predictor and Freda was to be a Spotter. Basically, the Spotter would carry out the initial observation via telescope and relay a signal to the Predictor, who operated a large machine that predicted the range and height of the target. Once on target, the Predictor would then signal the gun operators to fire. The guns we were working with were 3-7 guns, which was the regular size, although when we were later posted to Anglesea we were operating with 4-5 guns. For practice, the guns would fire at targets pulled along by a plane over the Irish Sea. I was stationed a couple of months each at Devises and Anglesea batteries before I was posted to 545 Battery at Polbethick, near Looe in Cornwall. It was then that I volunteered to become a PT instructor — although I might not have if I had known hold cold it was going to be at Stirling Castle in Scotland, where I trained! I spent nearly a month training to become an instructor, but the freezing conditions turned out to be worth it when I returned to Polbethick and could enjoy having everyone, including NCOs and officers, jumping to my instructions! I have very fond memories of my service at Polbethick, partly because we had very decent fellows and officers there, (many of the youngest were subsequently sent off on the Russian convoys) but also because the locals were so friendly to all the army personnel. We would at times need to call house to house to ask for old rags to clean our gunsand people would always be as helpful as possible. More than that, they would often invite us in for a cup of tea or a glass of cider. We and our fellow servicemen from the nearby barrage balloon site were also invited to the regular dances in the village hall. Of course, we didn’t always make it to the dance; there was a war on after all! I vividly recall one occasion when a lorry had been put into service to take us all to the village hall. I made an undignified sight when I got stuck climbing onto the lorry — and then the air raid siren went! On another occasion, I took the girls on a cross-country run to Looe, and we came across loads of winkles by the shore. Times were hard and rations were limited, so, ever resourceful, we packed as many as we could into our battle-dress pockets. Unfortunately, however, by the time we got back to barracks, the little creatures had crawled out of the pockets and were all over us. Not a comfortable feeling. And after all that effort, the cook refused to cook them because “they scream”! I had left someone behind when I joined up — my boyfriend Albert, or Bill as he was known in his unit on account of there being many other Alberts serving with him. He had not shared my enthusiasm for joining up, unhappy at us being parted and when eventually he received his call-up, he decided that he wanted to marry me. He employed a bit of subterfuge to get me to hear his proposal, however; he informed me that my mother was ill, on the basis of which I was granted compassionate leave. I was both relieved and surprised when I discovered the true reason for me being called away from service and, I’m happy to report, I accepted his proposal. We married without a penny (everything we needed for the wedding had to be borrowed!) and were immediately separated by our respective war duties. We managed a couple of leave breaks together, but my leave turned permanent when I became pregnant. 3 months into my pregnancy I was discharged. I had served for 2 ½ years and I admit I was disappointed to be leaving but I had new responsibilities now. I lived with Bill’s parents in East London for the rest of the war, contending with the daily menace of raids and doodlebugs. As things turned out, our daughter was 4 years old before Albert was finally discharged from the army. My largely happy times at Polbethick had nevertheless often been dangerous; Polbethick Battery did suffer direct attack during which we were caught in machine gun fire and I was at Crownhill Barracks in Plymouth when it suffered heavy bombing. There were other things to be endured; for instance the discipline of army life sometimes seemed unjust. I recall being confined to barracks for 7 days (a punishment we knew as “jankers”) after returning late from a 24 hour leave in Plymouth. The genuine reason for my lateness, that I was helping a sick friend, was not accepted as sufficiently mitigating. And I can’t help feeling disappointed that despite my loyal service I never received a stripe; even though the Predictor held a crucial position on the guns, the stripe always went to the number one. I should have been promoted on the basis of being a PT Instructor, but as I was effectively "doubling-up" my jobs and the officers were keen to keep me on as a Predictor (I had very good eyesight), I had to maintain my position. That’s just the way it was. Nevertheless, I can still look back and regard my 2½ years’ service as amongst the best times of my life. I made a nostalgic return to Polbethick about 7 years ago but all I found left were the cook-house and the concrete foundations of the gun emplacements. It was now a place “where sheep may safely graze” — and there were sheep there to prove it. My friend Freda found love at the barracks and married a Scots soldier; I have since lost touch with her. I have, however, kept in touch with my army days through the British Women’s Legion, the local branch of which I attend most Tuesdays. At the moment I’m looking forward to a Veterans’ event in a Marquee at Victoria Park in Paignton. It will be a great opportunity to share memories of my days in active service.